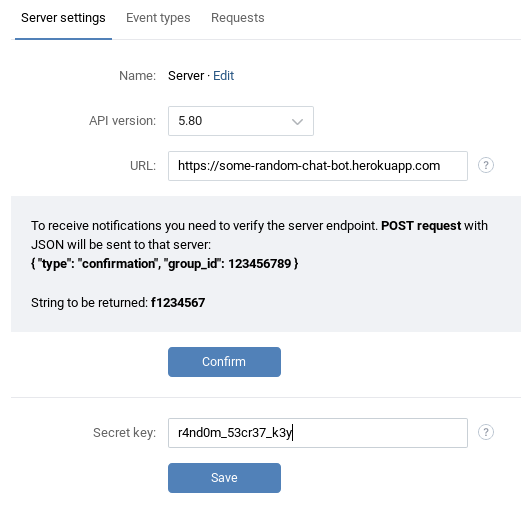 This guide will walk you step-by-step through deploying an example chat bot (which can be found in the u32i64/vk-chat-bot-example repository) for a community using Heroku. Visit signup.heroku.com and create an account there. After completing the registration process, visit your Heroku Dashboard. Create a new app with any name that is available. In your community, go to Manage. 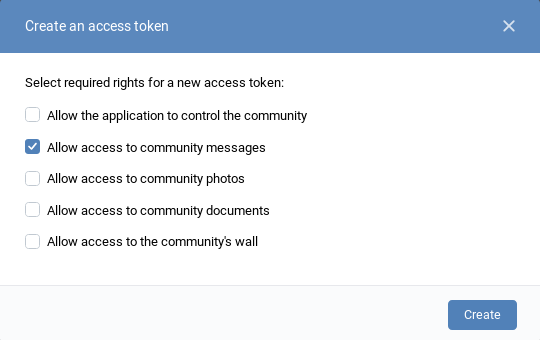 Go to Messages tab, and enable community messages. 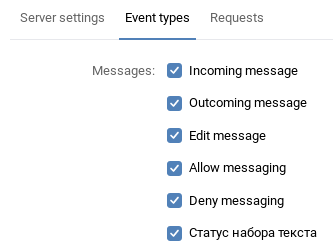 In Messages -> Bot settings enable Bot abilities, and then enable Add start button. Go to Settings -> API usage. Save your new token somewhere. Now switch to the Callback API -> Server settings tab. Set the API version to 5.80. In the Secret key field, enter your own random combination of characters. Click Save below that field. Go back to Server settings tab and enter in the URL field: https://your-app-name.herokuapp.com/ (Replace your-app-name with the name you specified when creating a new Heroku app in step 1). Don't press Confirm and don't close this page yet. Make sure you have git and Heroku CLI installed. If something is not working, feel free to open an issue on GitHub. Now go back to VK's Callback API settings, and press the Confirm button. 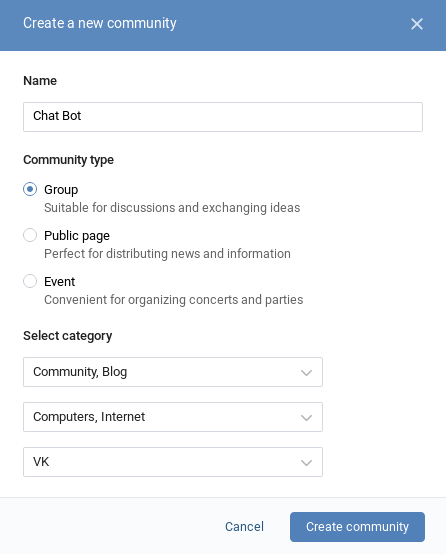 Congratulations, you have just made your own VK chat bot!